Спасибо, ildarrrr, за эту серию пластинок МакДаффа. Пока в ближайшее время по МакДаффу будет небольшой перерыв, но у меня в запасе много еще интересных пластинок. When I first heard Jack McDuff, a bit less than two and a half years agof he was working in a road side bar up state New York. The place had that atmosphere which the movies sentimentally associate with the beginning or end of an artist’s career, but which really represents a way of life for thousands of struggling singers and musicians. It was noisy, nasty, and dirty, and nobody really gave a damn who was on the stand or what was being played-nobody, that is, but Jack McDuff. I don't think the fact that he and his group were there just to accompany the conversation ever entered, his mind. At every break he'd pull the band over to an empty table and—just as if they'd finished a Carnegie Hall concert—give them a running critique of the last set. After a few minutes, back again they'd go, convinced the only reason nobody had listened was that—as Jack had fust said—they just hadn’t played well enough. So, through all the grayness that surrounded him, Jack tried to poke some musical reds, and yellows, and blues. Not an “artist" in the most modern sense of tie word, he found it impossible to put down his inability to communicate to the “squareness" of his audience. He only knew to try harder and harder to pass on to his audience those things which he felt in his music. For fifteen years Jack had been trying in one joint after another to get his message past the pick-ups at fhe bars and the tip-hungry waiters. Maybe I’m a cynic, but I think he could have tried for another fifteen years and not succeeded. But what people don’t listen to in the road houses, they do listen to in their living rooms. Thank goodness for the LP! Beginning with Screamin' (Prestige 7259) at the end of 1963, and followed by the enormously successful in person albums, Live! (Prestige 7274), and Brother Jack At The Jazz Workshop (Prestige 7286). McDuff began to sell records in enormous quantities. As talent buyers follow the record charts intensely, jobs at better places began to filter in. The “corner bar" began to be replaced in McDuff's itinerary by “The Showboat" in Philadelphia, “Birdland" in New York, and, of course, “The Jazz Workshop” in San Francisco. A new world was opening for Jack McDuff, one in which those noisy, gray faces on the bandstand were replaced by interested, smiling ones. And it has gotten better eve since. 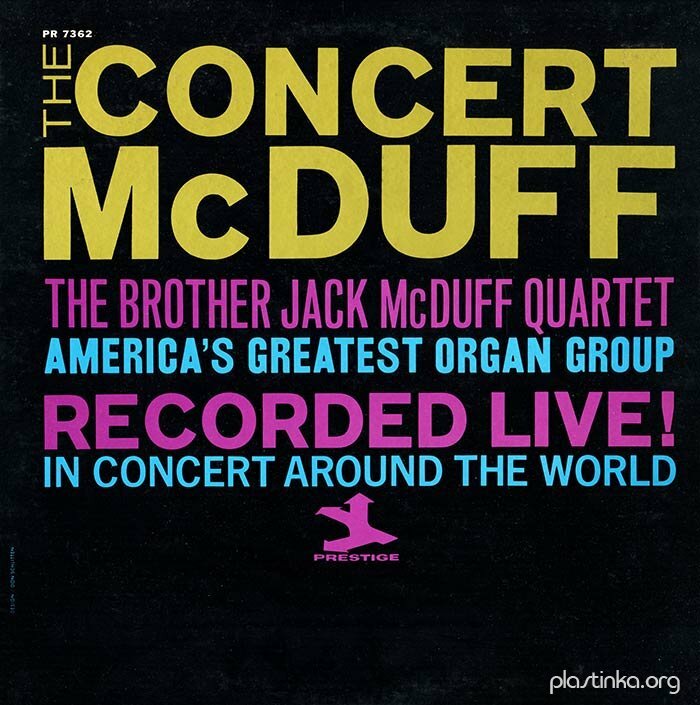 Last summer the Brother Jack McDuff Quartet made a tour of Europe. This is generally the high point in the career of an artist, and it certainly was for Jack. The European promoters, though, were not quite so excited. Only Jimmy Smith, among the soulful jazz organists, had preceeded him to Europe and then, only for a week. Whether or not European jazz audiences, noted for their attraction to the cerebral would take to McDuff was highly dubious. Their skepticism proved unfounded, though. At the Jazz Festival on the Riviera, McDuff and his group stole the show. According to NICE MATIN, “McDuff a vaincu tout le monde". And, in Sweden, the amazed proprietors of Stockholm's famous jazz club, The Golden Circle, saw their audiences dancing in the aisles. Even among the cool Swedes, McDuff’s exciting, emotional music drove home its message. The Concert McDuff contains selections of his repertoire as played during his European tour. Some are from his concert performance, others from his appearance at the Golden Circle. All, however, are first recordings by McDuff of these tunes. As this is the Brother Jack McDuff Quartet’s first small band album in over a year, you may note some fairly substantial changes in the sound of the group. The intense emotion is still there, but things are tighter musically. A greater use of harmonics has crept into their play, along with a variety of other subtleties. To the man, European critics marvelled that Jack McDuff could project so much excitement yet be musically so excellent. While you may not be quite so surprised at what you hear, I think you will understand the reason for their raves.